In this lesson, we will learn how to read and write integers including describing quantities having opposite directions or values. Complete the following sentence using “positive” or “negative”. Distances below sea level are represented by numbers, and distances above sea level are represented by numbers. The weather forecast predicted rainfall in April to be 2 inches less than normal. 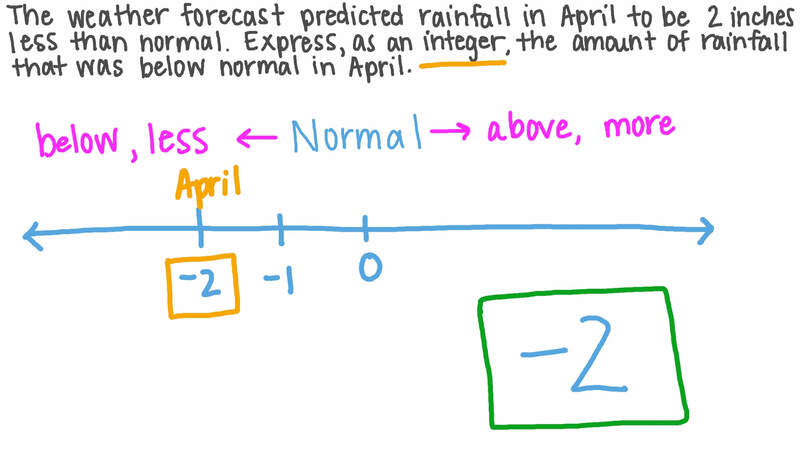 Express, as an integer, the amount of rainfall that was below normal in April. A certain stock lost 6 points in one day and gained 9 points the next day. 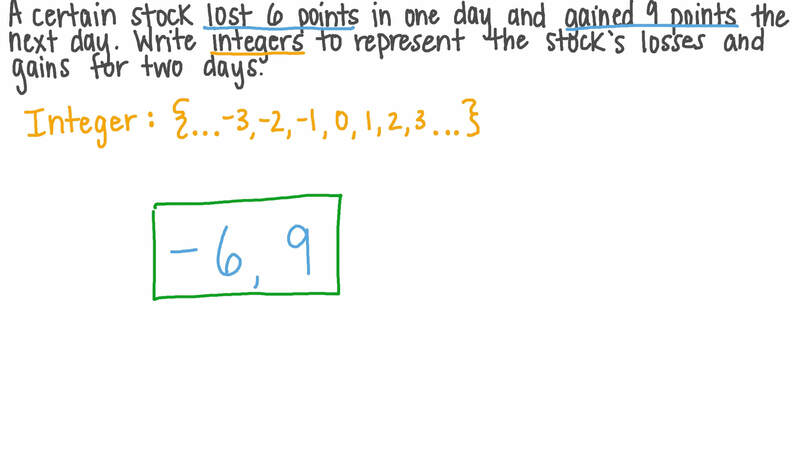 Write integers to represent the stock’s losses and gains for the two days. Is zero the smallest positive number? The number is neither positive nor negative. The smallest positive integer is . The smallest non-negative integer is . The greatest negative integer is . 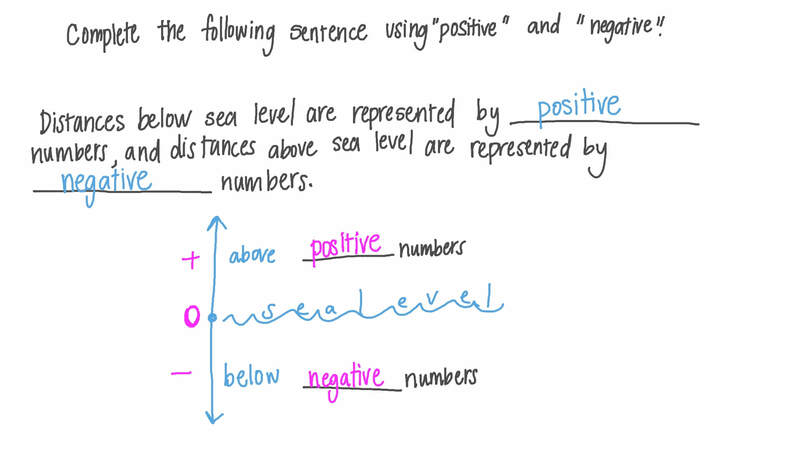 Complete the following using positive, negative, or zero: Sea level is represented by . Is the number 1 3 an integer? Express the following as an integer: 100 B.C. Write the integer to represent the following situation: A temperature is 8 ∘ C below zero. Express the following as an integer: 86 feet above sea level. True or false: 42 is an integer. A metal coin is at the bottom of a pond which is 4 feet deep and whose surface is at sea level. Express the location of the metal coin as a negative integer. In a bank account summary, debit is represented as a negative number, while credit is represented as a positive number. Which of the columns A–E represents all the events correctly? A bookshop gives away a notebook for every purchase over $66. If there were 50 purchases over $66 on a given day, which of the following represents the change in the number of notebooks the bookshop has in stock at the end of that day? The Han Dynasty in China began in 206 BCE, and the construction of the Great Wall of China started in 221 BCE. Did the construction of the Great Wall start during the Han Dynasty? A fee of $3.50 was charged to Nabil’s bank account. If we represent this loss by a number on a number line, between which two integers would the number lie? Mariam owed her brother $74. She paid back $33 and then borrowed an additional $8. Which of the following expressions represents this situation? Write − 7 [ 1 1 − ( − 8 ) ] in words. The maximum height that a certain type of bird can reach in flight is metres. Write an integer to represent this situation. What is the opposite of this integer?